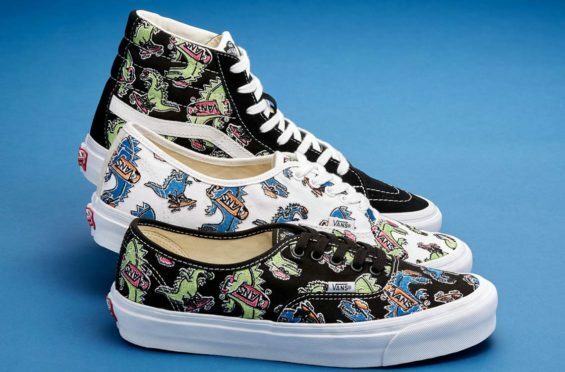 Barney's x Vans "Vanosaur" collection available today. Coming on the heels of Vans' latest NASA sneaker collection comes the brand's third footwear project with Barney's New York. Available today, Vans has teamed up with Barney's for an all-new "Vanosaur" sneaker collection consisting of six different styles including the Vans Old Skool, Authentic, SK8-Hi and slip-on. The Old Skool and Authentic silhouettes come in both black and white colorways, while the SK8-Hi and the kid's slip-on come in black. Each of the sneakers in the collaborative collection feature an all-over print of green and blue skateboarding-riding dinosaurs. The full “Vanosaur” collection is available now exclusively through Barney's web store, with prices ranging from $85 to $135.